When the Dodge Durango debuted in 1998, I wasn’t impressed. I didn’t like the design, interior, or handling. There were much better options in the SUV market at the time. Over the years, Dodge has done a good job of improving all aspects of the Durango. 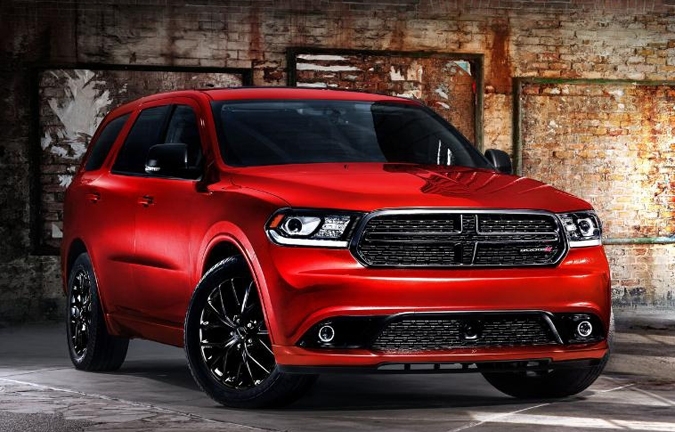 My favorite improvement so far is the Blacktop Package that gives the Durango a sporty, sinister look. The Blacktop Package features unique Gloss Black 20-inch aluminum wheels, dual rear exhaust with bright tips offering 295 horsepower with the V-6 and 360 horsepower with the HEMI® V-8, a Gloss Black crosshair grille with matching grille surround, Gloss Black side mirrors, Gloss Black exterior badging, black headlamp bezels, body color fascia and moldings, and five options for exterior paint colors. The Blacktop Appearance Package is available on Durango SXT, Limited and R/T models. The Durango’s new instrument panel features a redesigned center stack that houses the 8.4-inch Uconnect touchscreen. The bottom of the center stack houses a new media hub with an SD card slot, USB outlet and auxiliary jacks, as well as a storage bin. The new center console features a new segment-first rotary shifter for the standard eight-speed automatic that adds another level of refinement over the traditional gated automatic shifter. Manual shift functions have moved to paddle shifters on the back of the Durango’s new steering wheel. With standard seven-passenger seating and luxurious second-row captain’s chairs available on all models, the seats in the 2014 Dodge Durango can be converted to as many as 50 different configurations.